We are a paramount trader company of Shoe and Leather Industry products in the industry. We follow all guidelines to make our range more competitive in the industry. 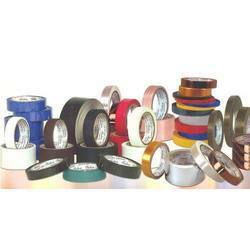 The entire range we offer is economic and long lasting high performance tapes for shoe & leather industry. These are available in different specifications. 1 Black/White nylon tape Black/White nylon cloth Rubber Adhesive 0.20mm 80gms/cm 45% 15kg/cm Used in leather and shoe industry For shoe upper reinforcement. 2 Black/White nylon tape with liner Nylon Cloth Rubber Adhesive 0.26mm 80gms/cm 45% 15kg/cm Used in leather industry. Used in footwear industry. 3 Nylon Non-Adhesive Tape Nylon Cloth - 0.17mm - 45% 12kg/cm Used in shore upper & shoe reinforcement. 4 Knitted Nylon Black/White Black/White Knitted Nylon Cloth Rubber Based adhesive system 0.37mm 200gms/cm 40% kg/cm Highly comfortable to reinforcement for back seams, front seams on boots & shoes. 5 Black/White cotton tape with paper linear Cotton Cloth Rubber Adhesive 0.28mm 180gms/cm 20% 8kg/cm Used in leather industry. Used in footwear industry. 6 Eyelet Tape Non Woven Synthetic Adhesive 0.38mm 400gms/cm 30% 6kg/cm Reinforcement throat, eyelets, and strong perforations Strong in either directions. Used by shoe & leather industry. Looking for Shoe and Leather Industry ?